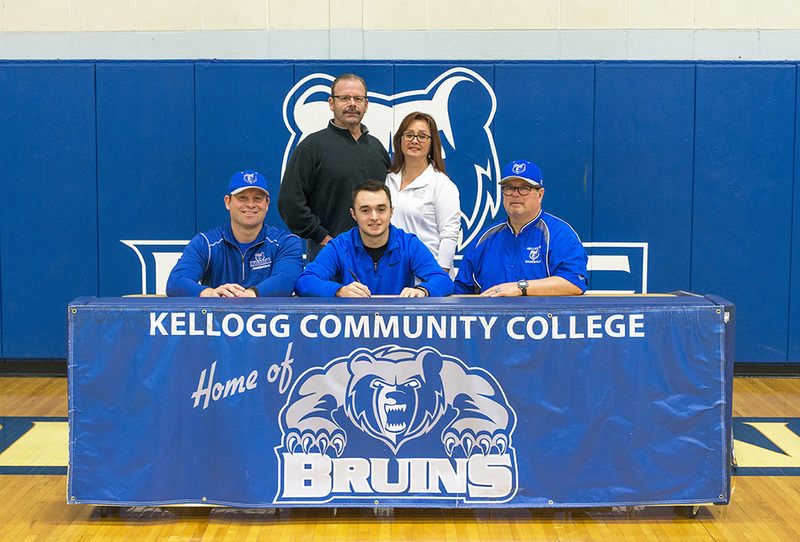 Riley Creamer, of Lansing, has signed a National Letter of Intent to play baseball at Kellogg Community College and will begin playing for the Bruins next season. Creamer, a senior at Lansing Catholic High School, is a four-year varsity starter who’s earned All-Area, All-District, All-Conference and First Team All-State Honors, in addition to being named to the Lansing State Journal’s “Dream Team.” Creamer hit .474 and hit two home runs his junior year and was named his team’s Most Valuable Player. KCC’s Bruins made their mark last season as conference and regional champions after winning the Michigan Community College Athletic Association conference championship and the National Junior College Athletic Association Division II North Baseball Tournament in May 2015. The team finished the season with a 23-3 conference record and a 39-16 record overall after going 2-2 in NJCAA Division II World Series play in Enid, Okla., in what was the team’s sixth national championship appearance since 1999. The team’s first home games of the 2016-17 season will begin at 2 p.m. Tuesday, March 29, as part of a doubleheader against Lake Michigan College at Bailey Park in Battle Creek. Admission is free. For more information about KCC baseball, visit www.kellogg.edu/baseball or contact Coach Laskovy at 269-965-3931 ext. 2536 or laskovye@kellogg.edu. Pictured in the above signing photo, in the front row from left to right, are Head KCC Baseball Coach Eric Laskovy, Riley Creamer and Associate Head KCC Baseball Coach Jim Miller. In the back row, from left to right, are Charlie Creamer and Andie Creamer.